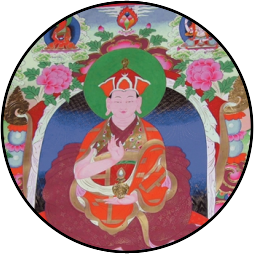 Jang Chub Dorje Shap, also known as the First Dodrupchen Jigme Thrinle Ozer, was the principle doctrine holder of the Longchen Nyingthig cycle of teachings. He was born in the Golok Province of Eastern Tibet, on the border of Amdo and Kham. At the age of three, he began to recount memories of past lives. At seven, his parents sent him to stay with his uncle, a lama, to study Tibetan and scriptures. He entered Gochen Monastery at the age of fourteen and spent the next 27 years studying, practicing and completing several strict retreats. He received many teachings and transmissions of Nyingthig from many great masters including Dzogchen Rinpoche. At the age of forty-one, Dodrupchen met his karmic lama, Jigme Lingpa who gave him the name Jigme Thrile Ozer, Rays of Fearless Enlightened Action. From his peerless master, he received the complete transmission of both kama and terma teachings, including the complete Longchen Nyinthig.